The Friedheim Home occupied the entire block between the First Pres. Church and Elizabeth Lane. Friedheim and Bo. Dept. Store on East Main Street was one of the most successful mercantile establishments in the region and operated for nearly a century. Following the Civil War, bright and energetic young men from Chester and Lancaster counties flocked to the new startup town of Rock Hill. One of these was Mr. E.R. Mills from the Fishing Creek Community of Chester County. He constructed the earliest home on this lot, which at that time took in two city blocks. About the same time, in 1866, Arnold Friedheim, a German immigrant and Confederate veteran settle in Rock Hill, opening a small shop on Main Street and later became the owner of the Mills - Friedheim home at this site. By 1898, his business had grown to include the sale of clothing and shoes, groceries, hardware, buggies, harnesses and furniture. 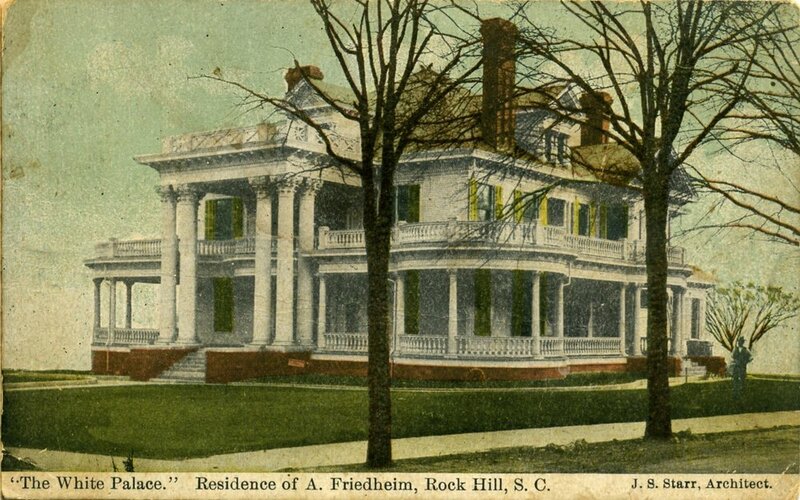 The Friedheim family, including Arnold’s three brothers, had become leading figures in the social, business, cultural life of Rock Hill. In the 1950s, the Friedheims sold the property to the City of Rock Hill, the house was demolished, and the lot became the location of the Rock Hill Municipal parking lot, located next to First Presbyterian Church. In 2015, the City welcomed a new enhanced undertaking for downtown, Fountain Park.